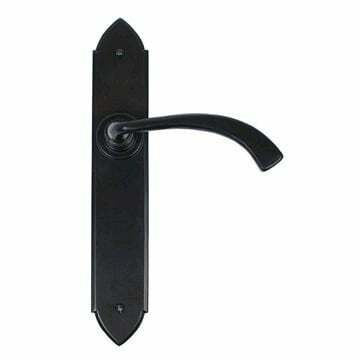 Antique Black Gothic Curved Handles. Supplied in all door handle variations. The Gothic Curved handle is part of the Gothic Lever Handles range by From The Anvil. The handle is manufactured from thick steel and baked in a traditional satin black finish. A very similar design to the Gothic lever in terms of the pointed arch backplate but with a softer looking curved lever.